It's hard to believe 2017 is almost over. It felt like it would never end, but we did. We survived this year. December started with a bit of chaos as I tried to finish all my school work before leaving to come out for my grandpa's funeral. I left the week before the semester ended, so it was a mad dash to finish all my work. I was so grateful to be with family to celebrate my grandfather's incredible life. His funeral was just as he would have wanted it- ending at a graveside with cows in the field next door and people riding by on horseback. The picture above is of the flowers on his grave the next morning, covered in frost. The rest of the month has been full of family and friends, spread across the three West Coast states. I'm so grateful to call so many beautiful places home. I don't feel like writing a whole 2017 wrap-up, so this will have to do. 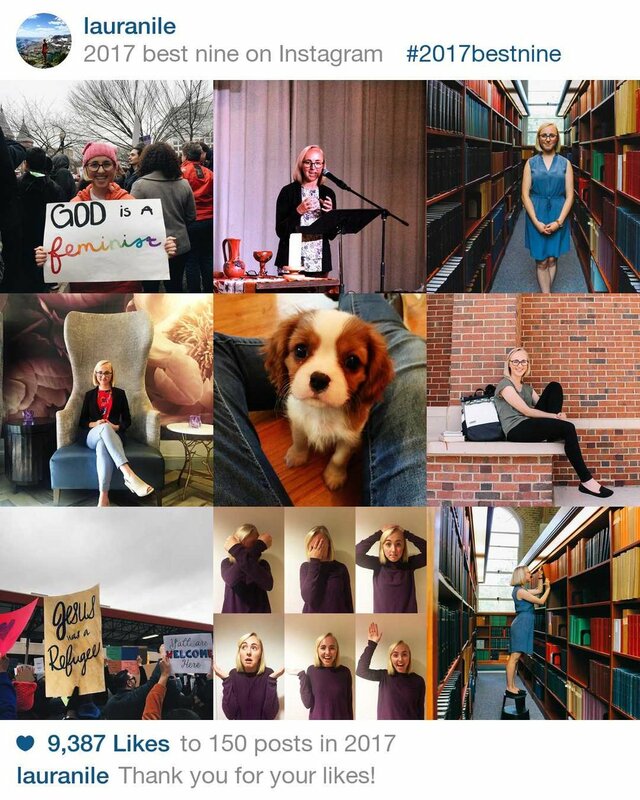 It's been quite a year- protests, travels, big ordination steps, and fun adventures. I'm ending the year feeling exhausted and grateful for a several-week-long break. This year has forced me to wrestle with big issues of politics, justice, inclusion, and my own flawed self. I've been stretched in a dozen ways and it's made me stronger, and hopefully, kinder. I'm grateful for this year, even the difficult and painful parts. Over Christmas break, I finally got around to re-reading A Wrinkle in Time, in preparation for the upcoming movie. My dad read it to me as a child, but I hated it for some reason. I think it was a bit too abstract for me at the time. However, re-reading it was such a delight. I didn't know that Madeline L'Engle was an Episcopalian, so reading it felt like a more exciting, universalist Chronicles of Narnia. I can't wait for the movie to come out next year. Last year, my parents were living in Ethiopia and I missed being home with them for Christmas. It has been such a gift to be home this Christmas, particularly because of the food. We love to eat, and this month has been full of my favorite foods- turkey with cranberry sauce, stuffing, pie, lasagna, and my favorite- pizza. We have a pizza oven in our backyard and my dad decided to make the Christmas turkey in it this year, which meant we had to start the fire in it the night before. 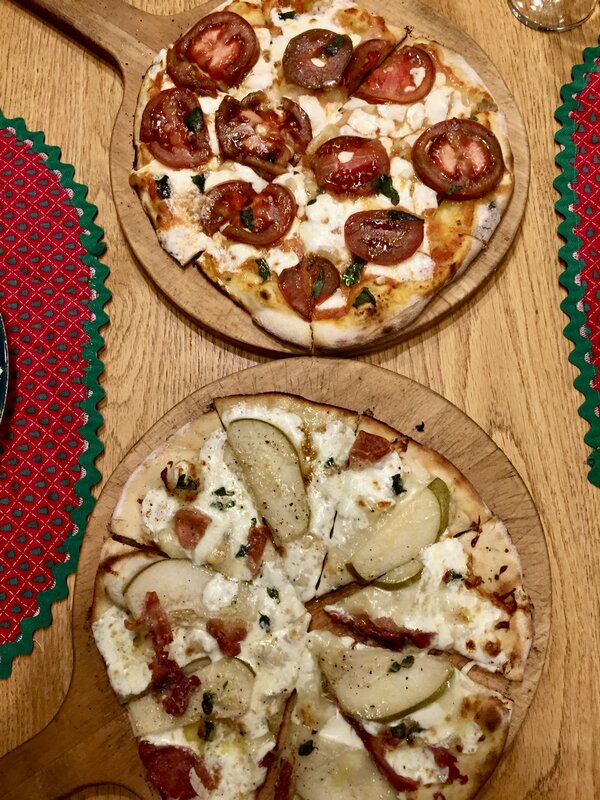 Even though it was only the three of us for Christmas Eve (my brother was with his finacé's family), we decided to do pizza for dinner. It was delicious and tasted just like home. I could have just as easily chosen The Crown (Season 2), but The Marvelous Mrs. Maisel was definitely the winner of December binge watches this year. Written and directed by Amy Sherman-Palladino, the creator of Gilmore Girls, Mrs. Maisel is a delightful series about a Jewish housewife in New York City in the 50's who becomes a stand-up comedian. It's sharp and witty, with great characters and fashion. I highly recommend it! There is no album that so singularly feels like Christmas than Mannheim Steamroller's Christmas Extraordinaire album. I have countless memories of this CD playing on the ancient stereo system at my parent's house. I played it on repeat throughout the month and it was such a great feeling of nostalgia and Christmas magic. After playing this game as a child, I got it for Christmas this year and we had so much fun playing it on Christmas Day. I'd rather have a game night than movie night, so I'm always trying to gather new games to play with friends. This game is a fun combination of luck and skill. My brother also introduced our family to Exploding Kittens, which is a great game. I've been on the West Coast most of the month, starting with my Grandpa's funeral in California, then time with friends in Washington, and family in Oregon. It's been great to have such a long time to be back on my favorite coast. I usually am overjoyed by the possibility of one day to sleep in, so having three weeks of rest is truly a gift.